We all know that childhood obesity is being focused on everywhere. But no one seems to give us ideas, they just tell us how horrible of a problem it is and how it cannot continue. That seems like a bunch of pish posh. 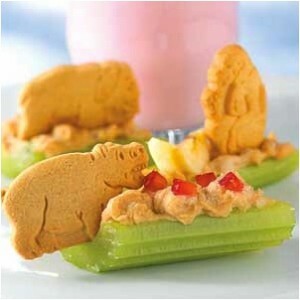 We can make healthy snacks fun! Children can be excited about food and still eat healthy! It’s all about the appearance. If it looks fun, it will be! Here are some ways to make healthy foods look fun. The only things contained in this picture is celery, peanut butter, strawberries and a single animal cookie, but it looks so exciting! By making the design seem fun and entertaining, children will be more drawn to it! We just have to disguise the healthiness, and the kids will be none the wiser! Also, by incorporating the single animal cookie, it seems almost like a treat, but they will be eating all of the healthy parts with it! Another idea of a healthy, fun snack are a twist on sliced apples. Apples are quite common, so they’re also not all that exciting. But what if we add a little something extra? These teeth are not permanent, and will make your child’s mouth taste and look great! Not to mention, who doesn’t like slipping in a pair of fake teeth every once in a while? It’s like dress up and healthy snack all thrown into one exciting piece of fruit! Not to mention, all of it is part of the apple, so it’s easy and cheap to do! Or we could make string cheese stick figures! Or fun fruit faces on our plates! There are many other fun ideas for foods, and these are only a couple of examples. Instead of focusing on how frightened we are for our children when it comes to obesity, we can just change their whole idea of what healthy foods should look, and taste like! And let’s be honest, these would way more fun for us to eat too! We can eat fun things as adults too, it would make life so much more entertaining. So let’s break from the norm and start making fun snacks for kids and adults! Not only will it make eating healthy easier, but it will make it more fun and exciting as well! Previous: Previous post: Sick Days with your kids! Next: Next post: Springtime Fun with kids!